Whether you are organizing an event/conference, or are exhibiting at a trade show, the marketing goal is the same: drive attendance and engagement. What better way is there to connect with potential attendees than through video? Especially when it’s delivered via email, the web, or social media using video. Testimonials: Make a point to capture some “man on the street” interviews during the event. These testimonial videos can be used before the event for promotion, during the event to promote engagement, and after the event to keep the conversation going! 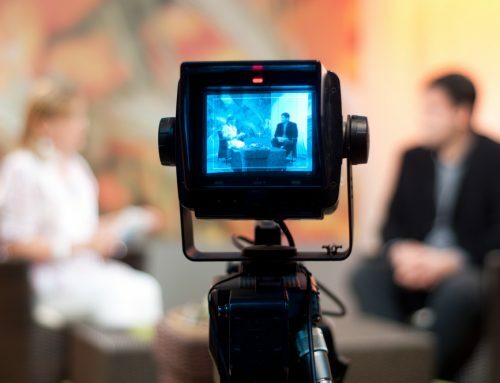 Don’t underestimate the value of (and number of uses for) a good testimonial video. Special Event Footage: Are you hosting a special dinner or a closing ceremony at the event? Footage of these events, of your guests networking and just having a good time in general can make a great reel to be used post-event as a recap. Don’t be afraid to throw in some humor; make viewers laugh and you’ll leave an impression. These videos, combined with some testimonials, are great for sharing with friends, family, and co-workers as a summary of what they’ve been up to at the event. You’ll also be able to use that footage next year when promoting the next event, signing-up new sponsors, etc. Corporate Overview Video: Create a brief video highlighting your company and/or the event with a call-to-action to register for the event or visit your booth at a trade show. According to an emarketer.com study, nearly 60% of respondents say they would prefer to watch a video over reading text on the same webpage. Videos are easy to digest. Not to mention that a great overview video can be used not only on the website, but in email, social media, and presentations, and in the trade show booth as well. Event marketing today is heavily dependent upon social media interaction, not only before, but during and after as well. The use of social media allows you to reach out to the masses with little to no financial commitment. With a strong list of followers, and the right content marketing, your campaign should hit the web and ripple through the social channels, exciting current followers, inspiring those you haven’t heard from in a while, and reach new prospects. Social media is a powerful tool, but are you using it to its fullest potential for your event? According to YouTube, 400 tweets per minute contain a YouTube link. 400! Don’t be afraid to put your video out there, if done well, you might be surprised how far it will reach. Besides being very social media friendly, the use of video in emails has shown to improve click-through rates, by up to 96% according to a study done by Implix. Video promotes the human element in marketing. Video allows your viewers to feel as though they are connecting with you through your video. Not to mention, you can say so much more in 30-60 seconds of video than you can in a static ad with an image and text. Both social media and video help give your company a personality. Your customers and prospects are much more likely to trust you if they’ve connected with you on a more personal level. Explore your video options today; there are possibilities for every budget. Interested in creating a video to highlight your next event? To learn more about our video production services click here. To speak with someone about your project, or to request pricing, please click here.